HIV is referred to (Human Immunodeficiency Infection) which is the most dangerous virus which is the major cause of AIDS in human life It is increasing the mortality rates in the world.It is transmitted through various ways such as unprotected sexual activities, blood donations without laboratory tests, from mother to children and many more. If we take a glance on the history of Aids, it was recognized by Centers for Diseases Control and Prevention (CDC) in 1981. It has number of bad impacts on the society as well as the lives of diseased persons living in the different places around the world. It has become a rapidly increasing disease which may cause of long illness as well as the discrimination between people due to this disease. AIDS has become a challenge for the world.So All the countries are trying to control its increasing rate through expert doctors and medical awareness programs though out the country. 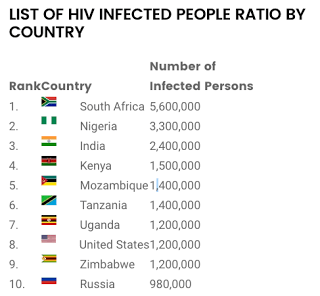 Since 2013 estimates, more than 44 million people are infected by HIV AIDS from which the majority of individuals belongs to Africa.There are many nations having the highest number of AIDS infected people following is a list of top ten countries with highest AIDS rates in the world.